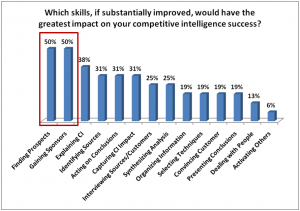 I recently completed a survey of competitive intelligence professionals. (The survey results are discussed here.) Although the sample size is small (16 professionals) and the results are not statistically valid, it is nevertheless interesting to note a couple of points. 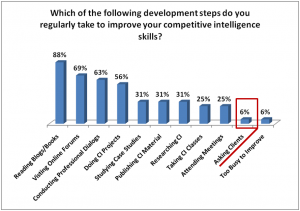 First, in response to the question about improving their competitive intelligence skills, only 6% of those surveyed indicated that they explicitly asked their customers/clients about how to improve. Think about that for a moment. Presumably, the decision-makers that commissioned the CI project are important within their company. Their ongoing support is critical for a successful competitive intelligence program. Furthermore, their perceived successful use of the CI data is often the best testimony to the value of CI. If the questions, “what did I do well and what can I improve?” are not asked, how can a value for the CI work be assigned? In my experience, it is dangerous (and foolish) to expect that the managers “will just know” the value. In fact, it benefits no one to leave this question open to debate. The CI professional loses when the feedback is not given because they miss the chance to calibrate their services and understandings. The manager loses because he or she may not realize the actual value of the CI input. The solution is to embrace a qualitative ROI. A qualitative ROI works best when it follows three simple principles. Establish the need at the beginning of the project. Indeed, this is among the first crucial conversations with the CI sponsor. “How will we know that the CI information helped you?” we should ask. If an authoritative quantitative measure is possible, use it. Otherwise, make clear that, working together with the manager, a qualitative method will be used. Set the expectation of continuous improvement. CI professionals and managers should know that the CI function is improving. The feedback cycle, therefore, is a critical engine for that improvement. Clarify that CI will continue after a specific project and ask that the manager contribute to future successes through their frank assessments. 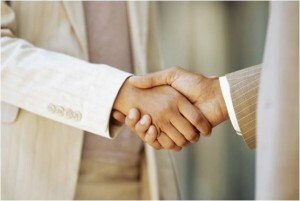 Make a mutual assessment the final deliverable. The end of a CI project needs to be defined as clearly as the beginning. A CI professional should make clear that every project has an explicit assessment after the final deliverable. A summary report describes how, where and when the CI helped. It also includes lessons learned about where it might have been done better. A second point from the survey confirms (for me) the importance of a qualitative ROI process. I asked about which skills (if improved) would make the largest impact on the respondent’s CI success. The graph shows the results indicating that half of the people felt that the finding clients and gaining sponsors skills would be the most impactful improvements. This is understandable when cast in the light of missing qualitative ROI’s. It is hard to attract senior managers to unproven support activities. Why would they spend their money or time on something when the benefits are not clear? What would they sponsor activities if the perception was that those activities do not provide value? And why would they support a function that is not actively improving? The short answer is that they would not. It is no wonder that CI professionals have trouble without this support. Yet, the remedies need not be complex. They start with accepting that qualitative ROI measures are okay when they are built into an ongoing dialog with management, part of a continuous improvement process and transparently reported. Managers can (and do) respect this approach despite a lack of numbers. What they cannot respect is unspoken assumptions of value (especially for a support function). As CI professionals, we can easily make value evident through planned discussions with the managers. Our livelihood depends on it and our customers will thank us when their perceptions about CI are corrected or reinforced. I tend to believe that “qualitative ROI” is an oxymoron – there is always someone in the decision maker chain who only understands numbers, and if you cannot provide them, you’ve lost. So, what to do? I recently heard the saying “Fake numbers always trump real insight”. I certainly do not suggest or use fake numbers, but I strongly support the client to calculate them courageously. One of my favourite tools regarding ROI of CI is to ask what went wrong in the past – where would you have been faster, won a deal, or avoided a loss IF you just had the right intelligence? It’s slightly unfair to use an ex-post perspective, but it’s much easier to calculate some numbers – at least on the possible ROI dimension. I strongly recommend the MP3 series with Mahan Khalsa on “How to Dramatically Increase Sales by Helping Clients Succeed” which is available for free from the FranklinCovey website (or other web sources)- for me one of the best hands-on explanations how to find a reasonable, quantitative ROI. Good points. “Qualitative ROI” (to me) means that the questions, “was it worth it?” and “what value did I receive?” can be answered satisfactorily by the client/customer. My fear is that not posing these questions prevents CI professionals from receiving valuable feedback. BTW, I really like Mahan Khalsa’s book, “Let’s Get Real or Let’s Not Play: Transforming the Buyer/Seller Relationship.” It contains useful models for agreeing to value expected at the outset of a relationship. If we used these models consistently (and well), there would be little issue about ROI for competitive intelligence engagements. 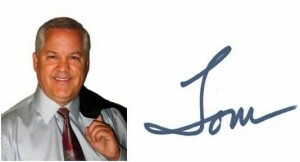 I’m having deja vu…This was a big workshop at SCIP and our even our past CI events at Frost. David Kalinowski and Gary Maag at Proactive Worldwide regularly present on the topic and they also developed a frame work for demonstrating ROI to the C-Suite.